Renewable Energy – What is It? 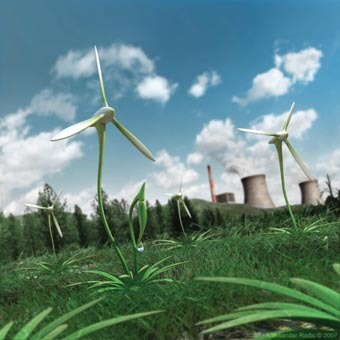 Renewable energy is seen as the replacement for fossils fuels. Before the supply of oil and gas has been used up, the world will have to find an alternative form of energy. Renewable energy is the energy provided by the sun, wind, water and other sources that will never run out. Biomass and Biomass CHP (Combined Heat and Power) is becoming more and more popular. Using organic matter, such as recently dead crops or plants grown specifically for fuel, biomass can help reduce the amount that is sent to landfill. Biomass CHP uses the heat created during the biomass process to drive a turbine which then generates electricity which can be used to provide heat and power. Many buildings that need a constant supply of power and heat, such as hospitals and hotels, and factories are taking advantage of biomass CHP. Wind turbines are becoming a more common sight, whether on the hills, or in the sea. These produce electricity which can then be supplied to the National Grid. As the UK is a fairly windy country, there should be many wind turbines in operation but they aren’t at the moment. The technology can’t be used everywhere, and many people are reluctant to have a wind turbine spoiling their views. Wind power is not as effective as you may think, and a wind turbine only produces electricity about 25% of the time. Using the power of the sun, solar energy is popular in sunnier and warmer climates. As the technology improves, it is becoming possible to just use daylight, rather than having to have several hours of brilliant sunshine. Already in the UK, there are homes and businesses using solar power to provide the electricity that they need. Nuclear power is often talked about as being a credible alternative energy source to fossil fuels. However, there is a lot of widespread criticism and opposition to nuclear power. In other countries such as France and America, nuclear power is much more widespread. Utilising the power of water such as waves and tides is not new. Waterwheels and dams have been used for centuries. The UK has not really embraced using water power on a big scale to generate electricity, despite being surrounded by water. People like driving their cars where and when they want to go, rather than having to rely on public transport which may not be as reliable or as convenient as traveling by car. This means that there is still a reliance on petrol and diesel and so oil. Electric cars are still in their infancy, and although can be used for city driving, they are not suitable for travelling long distances. This means that they are currently not suitable for most motorway journeys. As the technology progresses and electric cars are capable of traveling further without needing to be recharged, they will become a more viable alternative to petrol and diesel cars. Renewable energy and alternative fuels are becoming more readily available, and the reliance on fossil fuels is being reduced. See what you can do to help the environment. This entry was posted in News and Society on January 8, 2014 by admin_z.